The beginning of new series, I hope. The first book I read by this author. It was a pressure to read a book will there were clues present but the killer reason we’re hidden so well I did not know why. The mystery of the origins of blowing golden yellow is unique and I never thought it would be from this animal. The cat on the cover, Catrina is a secondary character. A recuse dog was mentioned for dog lovers. The main protagonist, Catrina, and her BFF were well developed. Police presence is minimal and did not miss. No one told Pamela not to explore the killing. 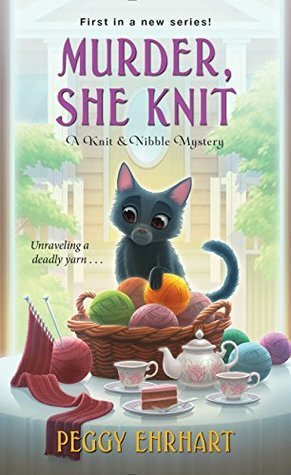 Two of my favorite subjects knitting and cats were combined to make an intriguing story. Pamela is hosting the knitting club at her home, after the meeting while searching for the Cat dish she finds the body of a friend who is another knitter. Pamela and Bettina, her BFF began to solve the mysteries that encounter. I am looking forward to the next book. I highly recommend this book. Knitting tips and a recipe are included. Disclosure: Many to Kensington Books for a review copy. The opinions expressed are my own. This entry was posted in #NetGalley, Books, Uncategorized and tagged Animal, Cat, Catrina, cozy mystery, Dog, Favorite, knit, Pamela, Peggy Ehrhart. Bookmark the permalink. I still have to read this one.